It's the end of the year and you've made it through another year or music-making, concerts and paperwork! I want to celebrate you and all you do for your kids with a giveaway! So what am I giving away? 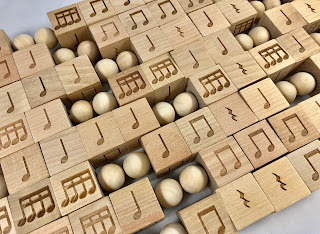 Well, I'm so excited to be announcing that my new and improved Rhythm Blocks have arrived! And you could win a set of 10 by entering in the Rafflecopter below! These new sets feature laser-engraved rhythms and still rotate smoothly as a one-piece manipulative. They are easy to store, easy to pass out and fit perfectly into small hands! They are great for dictation, decoding, composing, and even improvisation. Rhythm Blocks now come with a PDF full of lessons and additional lesson ideas. To win a set of 10, enter below and be sure to visit my Facebook page! Winners will be announced Monday night at 6:00 pm CST. Hi! I visited your Facebook page. Is that the only thing I need to do in order to enter the give-away contest? Thanks! That's it! Well, that and make sure you went through the Rafflecopter steps! Good luck and thanks for visiting! They look amazing!!! Thank you for dedication!